2008. Ginkgo, turned and carved; ca. 5 X 3.5 inches. 2011. Ambrosia Maple, 10.5 X 7.5 inches. Turned, carved and bleached. 2014. 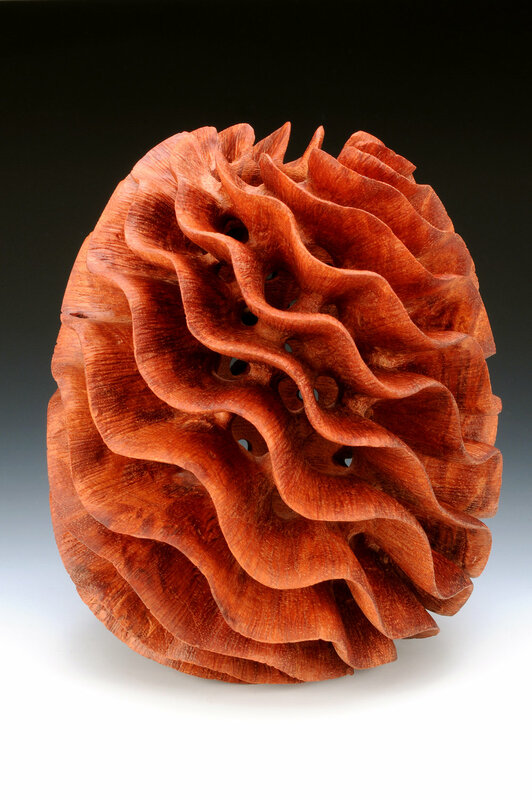 Redwood burl; 5 X 4.5 inches. Ceremony Exhibit: catalog is here. 2005. Walnut. Surface enhancement: pyrography and acrylic paint. Approximately 3 X 3 inches. 2007. Marbled Ebony, 4.5 X 2.25 inches. 2006. Ambrosia Maple, 4.25 X 3 inches. David & Ruth Waterbury Collection. 2006. Ginkgo, 3 X 2 5/8 inches. 2009. Red resin tree burl, 4 X 3.25 inches. 2009. 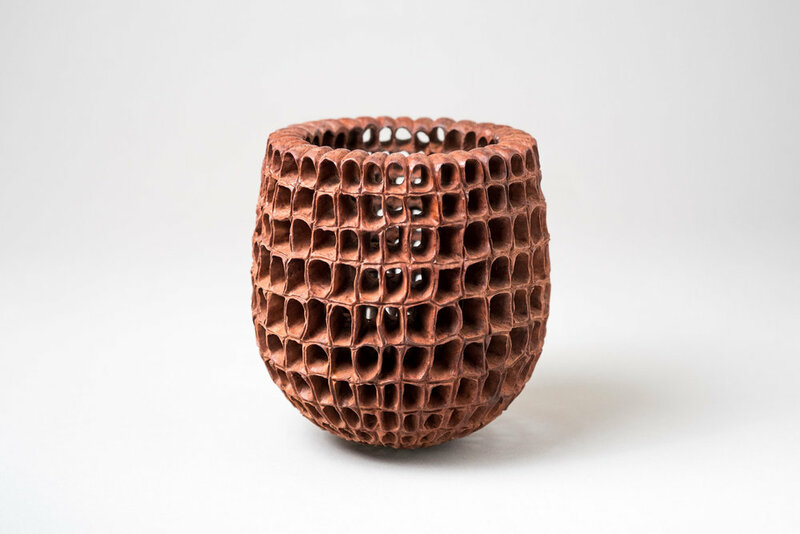 Afzelia burl, 6.5 X 5 inches. Turned and carved. 2011. 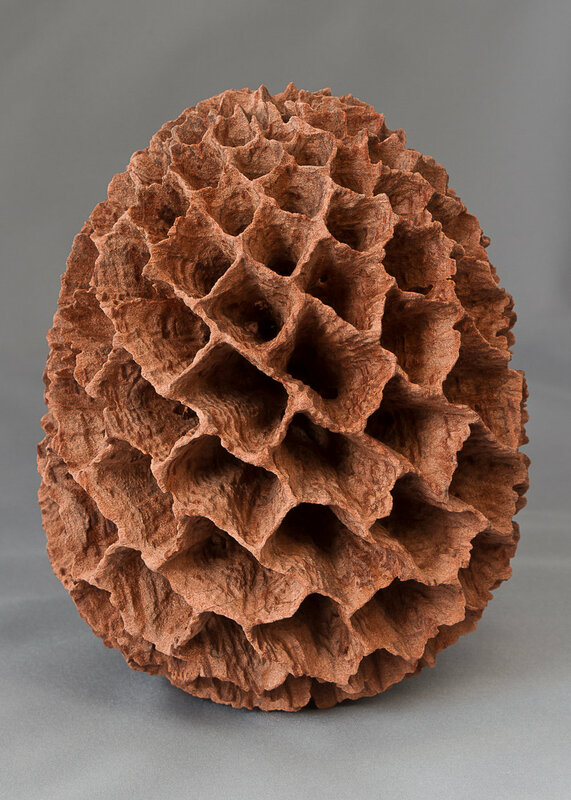 Redwood burl, ca 5.75 X 4.5 inches. Turned, carved and sandblasted. 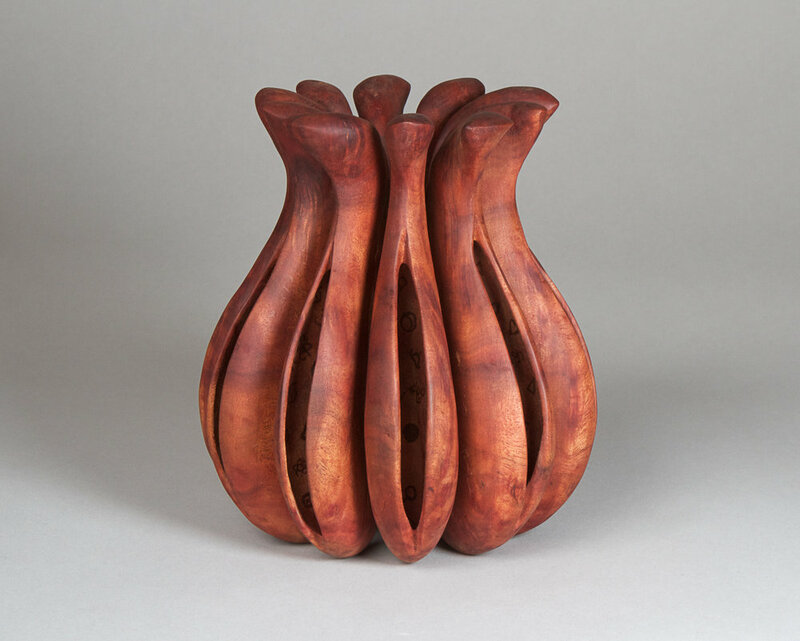 Roots - The Artist’s Voice exhibit, American Association of Woodturners. Catalog is here. 2012. Camphor Burl, ca 5 7/8 X 5 3/8 inches. 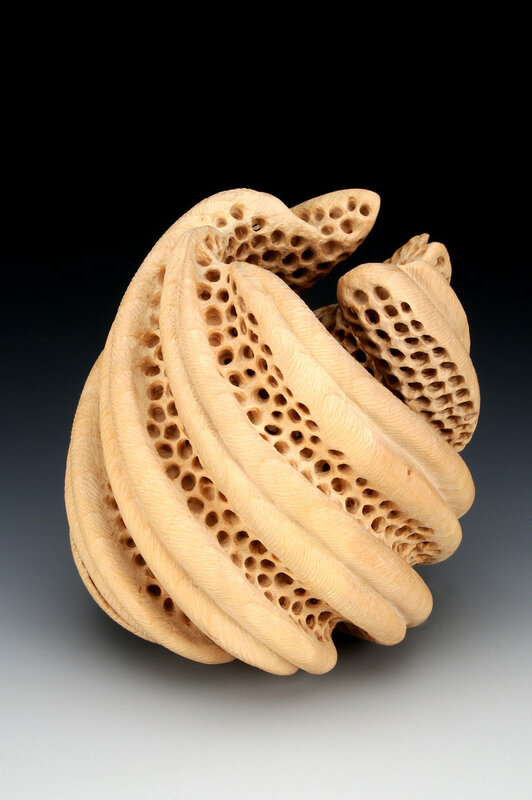 Beyond Containment Exhibit, American Association of Woodturners. Catalog is here. 2017. Claro Walnut, 4 X 1.75 inches. 2010. Big Leaf Maple Burl, 3.5 X 3.25 inches. 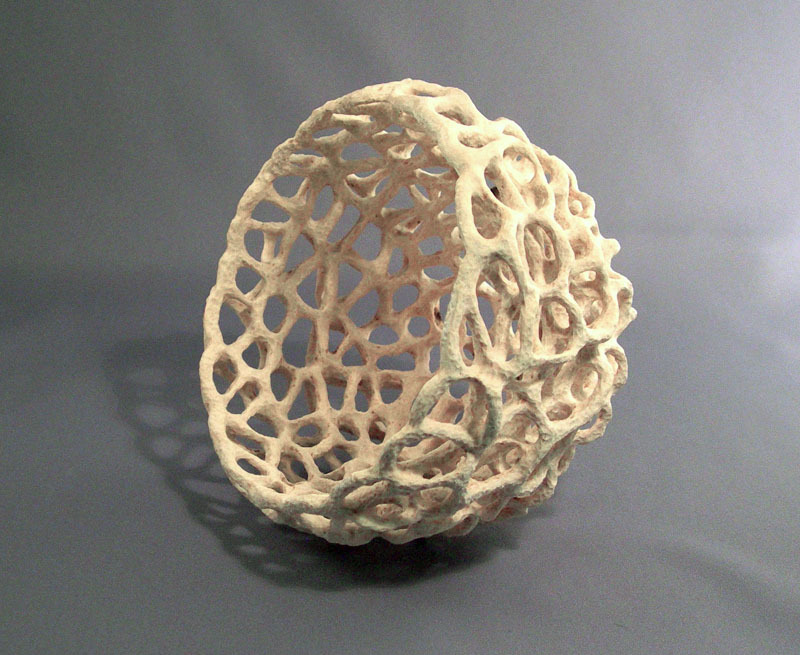 The title of the piece reflects the inspiration for this carved surface. I was thinking of tracheids - one of the cell types for wood. These are elongated cells that are pointed on each end and the walls of the cell are dotted with pores to allow the water to percolate from cell-to-cell. 2015. Big Leaf Maple, 6.75 X 2.5 inches. Merging Exhibit, American Association of Woodturners. 2019. Maple, Ebony, Acrylics; 5.88 X 5.75 inches. 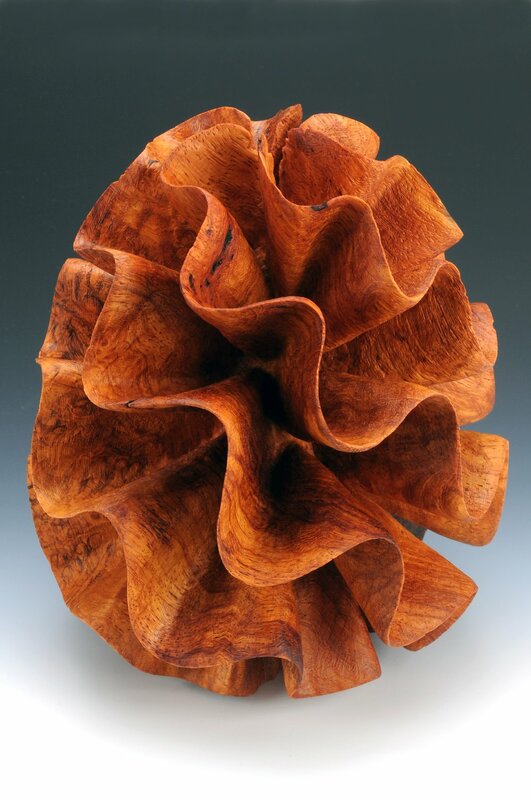 Traces Exhibit, American Association of Woodturners. Inspired by fossils of Lepidodendron - giant club moss trees from 359-299 million years ago. 2019. Collaboration for ITO Brewery; 9 X 2.5 inches. 2019. Canary Wood. 3.75" W X 2" H. This is my conribution to the Ray Key collaboration project. About 100 artists were sent a roughed-out piece from Ray's works-in-progress that were stored in his shop at the time of his death. There will be an exhibit this summer, with an online auction at the end of the show.